After reading, in an English language magazine in Indonesia, a badly researched, overgeneralizing article falsely comparing Dutch Colonialism in Indonesia and British Colonialism in India, I penned a harsh, but civil, response, and submitted it. To my surprise, the editor loved it and published it in the next issue. As an Indian-American currently living in Indonesia, I was surprised to read Mr. Rooseboom’s recent article comparing the Colonial experiences of Indonesia and India and showing the British in a better light than the Dutch. Unfortunately, in my time here, I’ve often heard Indonesians lament that it would have been better had they not been colonized by the Dutch, even hearing this from the mouth of Indonesia’s former President B.J, Habibie at a recent conference. The reality, of course, is far more complex, and here I hope to provide a different angle than that of Mr. Rooseboom. To move into a better future, we need to recognize the misdeeds of the past. We have not. We live in a nation-state, capitalist world, built upon the foundation of an older system; colonialism, and the exploitation it fostered. We need to break this connection. Borders, drawn by colonizing powers, with no regard for local customs, culture, or systems, and European languages, pervade, along with the western-colonial legacies of nationalism, ethnic politics, and more. The top GDP per-capita countries in the world are all, without exception, colonizing powers, or settler countries like the United States, Canada, Argentina, and Australia. I wanted to express that colonialism, by definition, was an atrocity simply because it placed one group of people over another. There are differences in the details – the genocidal mercantilism of the Americas, the divide and conquer of India, to the forced “free trade” opium markets of Asia. However, all had at their base the same philosophy, and by stripping agency away from the colonized, European elites deprived most of humanity of the ability to determine their own future. To grow. As the present world situation – war, strife, poverty, cultural loss – clearly demonstrates, 60 years is not time enough for healing a 400 year long legacy. I didn’t think this was a controversial article. To me, the son of Indian parents, a follower of Gandhi and Mandela, it was common sense. However, the reaction has been surprising. The latest, this rant below, from a European male. I lived in the British colonies for years and find your statements misleading and partly, perhaps unintentionally, untrue and therefore affecting the sentiments of other people less knowledgeable. I refer to your point about growing tracks of Opium in modern day Bangladesh. This was empty land. Trade with China was booming in 18th century for tea, porcelain and silks, and loaded onto fast Clippers via the Roaring Forties to London where wagers for first arrival and first Insurance was developed in Fleet st, London. Trade was only thru Hippos appointed by the Emperor of all China. Trade had to be in silver bars until the Crown was running out of silver. Britain found the largely unfarmed soil in Bangladesh yielded the best opium..so the trade began and the navy had the job of securing the passage down. Britain supplied what was asked by way of trade. Opium was unknown in England. Now to yr article refers to Resources, one thinks of minerals today. In fact it was for tea, coffee, spices, timber mostly. Certainly the British established these and built a legacy of roads, rail. Telegraph, Administration, Law and Education where there was none. 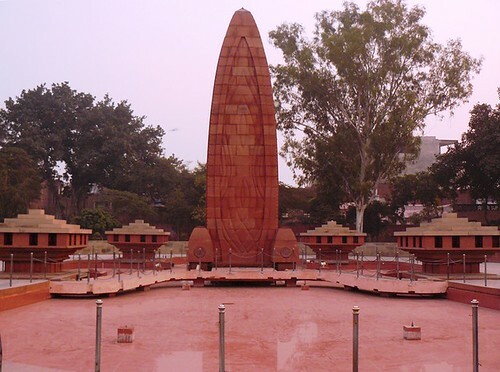 Memorial at Jallianwala Bagh India, where British soldiers massacred over 1,000 peacefully gathering Indians in 1919. To me, it is amazing that attitudes like this still exist, glorifying exploitation. Empty land? Education where there was none? This is a major problem, and shows that we have yet to really move on from European colonialism and the destruction of diverse global worldviews. Instead, we are mired in debates about the past while that very past perpetuates itself. We say we’ve moved beyond colonialism and then willfully let Tibet be exploited for resources and Governed by an outside power, or wars to fester along ill-drawn colonial borders, under the same rhetoric that exploitation is a boon for “uncivilized, lazy people”. Recognize the past, and eliminate its affect on the present. This is exactly what my piece argued for. The truth is, there is no such thing as good Colonialism and bad Colonialism. Pre-colonial India and Indonesia had vast empires, incredibly achievements in arts, literature, and culture. Malay sailors connected the archipelago through intricate networks of trade, while spices flowed from the Malabar coast of Southern India all around the world. The British and the Dutch stunted both countries growth and subjugated them to horrific, destabilizing exploitation. The wealth we see today in the ornate old buildings of Amsterdam and London is directly connected to the poverty still visible in Jakarta and New Delhi. Comparing the British and Dutch in India and Indonesia are akin to trying to judge different shades of injustice. The truth is, there is just injustice when one people exert control over another and exploit them for gain, no matter how altruistic the rhetoric. In time, I believe both India and Indonesia will be able to recover from the damage wrought by Europe, but it will be a long, hard process, and we should always remember that it didn’t have to be this way. When anyone says that the German occupation of Poland wasn’t that bad, or that Japan helped make China modern, the criticism they receive is, rightly, enormous. Yet, it is okay for someone to defend British colonial practices. The British, we must remember, were the biggest Colonizer. They set the tone for the entire system. But, unlike the Germans or Japanese, the British won. Yes, there are differences, that’s not the point. One atrocity doesn’t make others okay. The initial British annexation of India, or the Dutch takeover of Indonesia were not that dissimilar to what the Japanese and Germans did in the early 20th century. Concentration Camps and Mass Killings in Africa. In Kenya, blacks were forced off their lands (there is a reason the most agriculturally productive part of Kenya was called ‘The White Highlands’), subjected to harsh rules (pass laws, head taxes, enforced segregation, concentration camps etc), and during the Emergency, an estimated 70,000 – 200,000 blacks were killed (torture, malnutrition disease in concentration camps etc). The British invented concentration camps, and the Germans took the idea to the next level. Manipulated famines to suppress Independence in India. Sir Winston ignored pleas for emergency food aid for millions in Bengal left to starve as their rice paddies were turned over to jute for sandbag production and supplies of rice from Burma stopped after Japanese occupation. Between one and three million died of hunger in 1943. The wartime leader said Britain could not spare the ships to transport emergency supplies as the streets of Calcutta filled with emaciated villagers from the surrounding countryside, but author Madhusree Mukerjee has unearthed new documents which challenge his claim. “It wasn’t a question of Churchill being inept: sending relief to Bengal was raised repeatedly and he and his close associates thwarted every effort. Winston Churchill, killer of millions in India, later, Gandhi’s – a true hero – chief adversary and launched his career by personally overseeing massacres of people in the Sudan. A hero in England today. Going deeper, the parallels between the British and Nazi Germany are stark. Hitler’s dream of Lebensraum, living space, in Eastern Europe for German expansion, is it really that different from the mass migrations of people into British controlled Canada, the American Colonies, or Australia? The colonization of North America and Australia wasn’t laid out in such blatantly racial terms as the Nazi wars of conquest in Poland and Russia, but the outcome was akin to Hitler’s dream – displacement of the indigenous people culture, language, and society until, today, Native peoples are barely 1-3% of the population in all three countries. The British have never apologized or atoned for what they did in the Americas, Africa, or India. The same Royal Family and political system that allowed for the genocide of Native Americans and the enslavement of India still exists. In fact, they have tried to hide that horrific past. This is why I respect Germans far more than other Europeans – they understand their history, and the atrocities of their past. The rest of western Europe has yet to realize that German aggression during World War II is directly related to French, British, Belgian, Dutch, Spanish, and Portuguese actions in their overseas colonies. Genocide wasn’t invented in Eastern Europe, it was invented in the Americas and Africa. Swedish historian Sven Lindqvist explains this magnificently in his book Exterminate all the Brutes, an exploration of the colonial roots of Nazi racial theories. “To them, freedom exists where they rule,” Amitav Ghosh, The Glass Palace, referring to European concepts of Freedom. “The worst thing that colonialism did was to cloud our view of our past.” Barack Obama, Dreams of my Father. We need to truly understand and acknowledge our past, and the forces (capitalism, trade, racial theory) that made it possible, and then move towards a common, greater humanity. I don’t want to punish modern Europe for the past. But I do think that British nationalism tied to the past is dangerous, and unfortunately, perpetuates a system of exploitation and cultural destruction. Nationalism, nation-state, and colonial borders all need to disappear. Firstly, let’s acknowledge that the colonialism hasn’t died, its still here, in its worst forms. Tibet, Palestine, West Papua, Chechnya, Tamil Eelam, East Turkestan, Amazonia, are a few of the places still under the throes of exploitation, aided on by western Corporations and the nation-state system. This is the past we haven’t atoned for perpetuating itself. Then, no more debating who was the worst or best colonial power. Accept the past fully. Educate our citizens not in abstract, false national pride but in our common human history. Invest heavily in those countries that suffered the most during colonialism. Protect the remnants of once great cultures that are now hanging on by a thread, to atone for those that no longer exist. (Aztec, Inca, Herero, Tasmanian). “All I object to is the slimy white man’s burden humbug. The pukka sahib pose. It’s so boring….Why, of course, the lie is that we’re here to uplift our poor black brothers instead of rob them. I suppose it’s a natural lie enough. But it corrupts us, it corrupts us in ways in you can’t imagine.” George Orwell, Burmese Days. The remnants of this attitude, with Orwell experienced serving the British crown in Burma, is what I’m fighting today. It is not only the oppressed who suffer, but also the oppressor. I think the fact that my piece touched such a nerve among so many people shows that they realize the hypocrisy of the modern world, that their lives are tied to a system that built Europe, that allowed the spread of English and capitalism and devalued culture, family, and true, Eastern spirituality. Even us, the oppressor nations, will be free once we understand our past. Then we can build a new, human and nature centered global paradigm. No more fighting the battles of the past. Make a clean break, for the change to build real prosperity. I believe. We can do it.